“On finishing my A levels, I was directed towards London Art Portfolio by word of mouth recommendations. Working on the six week course helped me both to understand the importance of creative process and to establish my own artistic interests outside of the structure of a set curriculum. “I’m really enjoying studying Fine Art and Film Studies at Oxford Brookes but it wouldn’t have been possible if it weren’t for LAP! With only a 6 week course my way of projecting and creating changed remarkably and improved technically as well. LAP was an immersive experience and a vibrant arty place, a perfect place to start an artistic journey. All the tutors’ dedication and passion drove me to work hard and stimulated me to experiment my ideas with different mediums and it was these teachings which were the source of some of the installations I created at OB. Life drawing and 3D model making also helped me to have a great sense of space and composition too. Most of all Julia gave me the tools to be able to be creative in every context and she helped me to build a very succesful portfolio. “For the summer I decided to consider doing something specific for my further education, which turned out to be a fantastic experience that I’ll remember for the rest of my life. I spent six weeks in one of the most incredible cities in the world: London. Where I attended a course at London Art Portfolio, in order to develop a portfolio for my university application for architecture. I have a great interest in art and architecture, but I had never attended an art course before, so it was all kind of new to me. 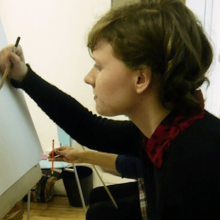 I found London Art Portfolio the best choice as the courses were made up of very few people and the tutors were always available to give you a personal feedback. On the course I met people with different backgrounds and from different countries, it has been so interesting being able to compare my work to others and receive feedback from them. During the course I felt there was a very positive atmosphere, the students were working hard and were open to critics and the tutors were very interested in our ideas and able to give clever suggestions on how to build a very good portfolio. All in all, I think that the course was structured in a very useful way to develop the portfolio at its best. All the tutors have always been available to help us. I think that if you want to make the most of these 6 weeks and start to build a strong portfolio it is important to book 1-1 tuition, as I did. During these 1-1 sessions I was given personal feedback on my work and the tutor helped me to understand what was better for me to work on. Moreover they gave me some research to do on my own, which was really interesting. As a whole, the London Art Portfolio course was an extremely good experience for me. The atmosphere was very creative, free and friendly. Julia Dennis had a great way of helping me to organise my work for my portfolio, and most importantly, to make me understand what I want my work to be like. I would recommend London Art Portfolio to anyone looking to build up a portfolio and wishing to develop their creativity! The time I spent right beside Tower Bridge at the London Art Portfolio has been a wonderful month filled with creative work. It definitely improved the ability to use my hands and my brain in any possible way. I’ve ameliorated my observational drawing skills, got used to sketch everyday, learned to distinguish between ideas that have potential and other ones that didn’t need further development, but most of all, I am more certain than ever that I want to follow a creative career and that art is what my life should be filled with. The most productive weeks, for me, were week 2 and 3. The brainstorming process and the first development of ideas to put in my Portfolio really settled me up for the work I still will and need to do at home. Week 1 was a helpful start and provided the opportunity to produce some good drawings for everyone’s Portfolio. The Location and area of the Studio is more than perfect, coffee shops and supermarkets are nearby, as well as the print shop, that, if you smile a little brighter than you normally would, gives you great discounts. The studio makes you feel at home immediately and radiates an artsy atmosphere that inspires you from the second you walk in. The group I found myself in was quite international and really grew together after a couple of days. While producing material for my personal Portfolio I also made new friends that I certainly want to see again. I might not be done with even a quarter of my Portfolio, but I now know how to keep going, which is the most important thing for me. I would advise anyone wanting to pursue a creative career or apply for a degree course that requires a Portfolio to book a course at the London Art Portfolio. However, if possible, I would book a course longer than four weeks. The duration of four weeks might seem long but it will pass really quickly and other useful skills (such as the proper use of Photoshop) are taught in longer courses. Die Zeit, die ich direkt bei der Tower Bridge in einem vierwöchigen Portfolio-Kurs des London Art Portfolios verbrachte, entpuppte sich als ein kreativer, wundervoller Monat. Ich konnte definitiv meine Fähigkeiten, ob nun auf kreative Denkprozesse oder auf künstlerische Arbeit bezogen, merklich steigern. Ich verbesserte meine Zeichenfähigkeiten, besonders das abschätzen und aufs Papier bringen von Proportionen, ich gewöhnte mich daran und genoss es, jeden Tag zu zeichnen, ich lernte zwischen guten und weniger guten Ideen zu unterscheiden, aber am Wichtigsten ist, dass ich mir sicherer bin denn je, dass eine kreative Karriere und ein Leben voll mit Kunst das Richtige für mich ist. Die produktivsten Wochen waren meiner Meinung nach Woche 2 und 3. Der Brainstorming-Prozess und die erste Entwicklungen von Ideen machte mich bereit für die Arbeit, die es nun noch Zuhause zu erledigen gibt. Woche 1 war ebenfalls hilfreich, so gelang es jedem der Teilnehmer mehrere gute Zeichnungen für das individuelle Portfolio anzufertigen. Die Location des Studios ist hingegen wirklich mehr als perfekt. Cafes und Supermärkte sind nur wenige Meter entfernt und wenn man die Mitarbeiter des nahegelegen Print-Shops anlächelt, bekommt man auch einen Rabatt. Das Studio lässt einen sich sofort wie zuhause fühlen und ist ein Ort der Inspiration. Die Teilnehmergruppe, zu der ich vier Wochen lang gehörte, stellte sich aus verschiedensten Nationen zusammen. Wir alle teilten die gleiche Leidenschaft, Kunst, freundeten uns schnell an und trafen uns auch außerhalb der Kurszeiten für Aktivitäten. Ich bin mir sicher, dass ich den Einen oder Anderen irgendwann wiedertreffen werde. Vermutlich ist noch nicht einmal 1/4 meines Portfolios fertiggestellt, aber ich weiß nun, was es zu tun gilt, um es fertigzustellen. Ich würde jedem, der für sich einen degree course bewerben wird, bei dem ein Portfolio verlangt wird raten, einen Kurs am London Art Portfolio zu buchen. Trotzdem scheint mir ein längerer Kurs, der über vier Wochen hinausgeht sinnvoller. Vier Wochen scheinen eine lange Zeit zu sein, aber die Zeit vergeht unglaublich schnell und weitere nützliche Fähigkeiten (wie die Benutzung von Photoshop) werden erst nach den vier Wochen erlernt. Taking the 24 week course at London Art Portfolio has been a wonderful in helping me create a successful portfolio for my university applications. My time at LAP was an fantastic experience that significantly helped me in producing work that I was not only pleased with, but was good enough to be used as part of my portfolio. The course allowed me to challenge my skills and learn new techniques that I could use to develop my work further. It also gave me the opportunity to experiment using a wide range of mediums and I was able take advantage of the materials and facilities provided to us to be more creative and add more depth to my work. LAP also provides its students with a variety of tutors during teaching hours, all from different backgrounds associated within the art/design world, which I believe was very useful, as their different perspectives and input into the work I did, helped me to build up my work and formulate my own ways of thinking. I have definitely seen an improvement in the quality of my work from studying at LAP, and thanks to Julia Dennis and all the other tutors, I am confident that I will be able to use what I have learnt at a degree level. The opportunities offered by LAP, paired with the super friendly atmosphere at the studios would be useful for any art student, not just for someone who wants to study architecture. Working in a creative environment with students from all over the world every day definitely helped me as a gap year student to develop, and discover more about the design area I would like to continue on with in the future. I was also able to make some new friends along the way! I would like to say a very big thank you to London Art Portfolio for all the help and support they gave me and I would definitely recommend them to anyone looking to build a portfolio for any art/design area! LAP taught me to constantly experiment with different materials, try out crazy colour combinations and find solutions to my projects that I never would have tried out before. I learned to present my train of thoughts both in speech and images, something that made me confident in my interviews. I met loads of inspiring and wise students and teachers from all over the world and everyone supported each other, which contributed to a very open and creative atmosphere. Together we visited different museums, galleries, historical buildings and many other inspiring places that London has to offer. In the studio we worked both independently and in groups on our projects. Occasionally, we received briefings how to create paper models, how to best use paint, markers, crayons, charcoal, and other materials, how important a collage can be as well as the representation of a mind map. There was always something new to learn at LAP and I was always very eager to spend another day there. These 24 weeks was incredibly helpful and at the same time fun and I recommend everyone who wants a strong, creative and fun portfolio to start their journey here. LAP fick mig att ständigt våga experimentera med olika material, leka med tokiga färgkombinationer och hitta lösningar på mina projekt som jag aldrig tidigare skulle sett. LAP fick mig att tänka mer kritisk gentemot mina egna projekt, men samtidigt våga satsa fullt ut på en tanke. Jag lärde mig att presentera min tankegång både i tal och bilder, något som gjorde mig självsäker inför mina kommande intervjuer. Under mina 24 veckor hos London Art Portfolio har jag lärt mig otroligt mycket av designprocessen, men också träffat många inspirerande och kloka elever och lärare från hela världen. Vi stöttade varandra genom de olika projekten, vilket bidrog till en väldigt öppen och kreativ miljö. Tillsammans besökte vi olika museum, gallerier, historiska byggnader och många andra inspirerande platser som London har att erbjuda. I studion jobbade vi både självständigt och i grupp. Vi fick prova på krokimålning, skapa pappersmodeller, lära oss om olika program som t ex Rhino och Photoshop, skapa kollage, tankebubblor och mycket mycket mer. Jag är otroligt tacksam till de duktiga lärarna som stöttade och pushade mig genom hela processen. Dessa 24 veckor var otroligt roliga och jag rekommenderar alla som vill ha en stark, kreativ och inspirerande portfolio att söka dit. When I joined London Art Portfolio, it was my aim to finish my portfolio and apply to university for the coming semester. I started the course in June 2015 and the first week was very challenging. I explored a range of techniques that were new to me and it was difficult to be out of your comfort zone, but when you become comfortable it is a great experience. I learned a lot during this week about hands on drawing. The following weeks was an eye opening experience for me. We had to do a lot of research and begin the design process. It is good to be with people from different backgrounds because they share many ideas that can help with your project. I had the chance to do what I was really passionate about but knew little about. The project was great and I liked experimenting with collages and packaging to create my final piece. The 4 week course was very short and I wasn’t expecting to have so much work to show at the end – but I did! I liked Julia’s teaching style, she is so encouraging and had great ideas for each one of my project ideas. The different tutors that would come in were helpful as well because they had a different perspective on the project and it was another opportunity to talk about our work in preparation for interviews. I applied to different schools and so far I received 4 offers from the University of the Arts Camberwell, Arts University Bournemouth, University for the Creative Arts and Sussex Coast College in the UK and Intuit Lab in France. I feel so confident now and so happy to have had such amazing people helping me to achieve my goals. “I cannot praise the school enough! I came to LAP with very little artistic experience or knowledge, in fact to be honest, I could hardly draw but with the guidance and skills of Julia and her team, I quickly caught up! I don’t think I would have ever been offered a place at Kingston University, or been invited for an interview at St Martins, had it not been for LAP. The tuition is great – Julia and her team are dedicated, patient and knowledgeable. 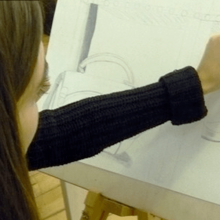 There are intensive drawing lessons to start each course, and after that, a very quick progression takes place! I also benefited greatly from the evening courses in Fashion Illustration, as well as the 1 on 1’s that Julia offers. I think I really benefited most in the last 6 weeks, when I had more confidence to let my creativity unleash. I don’t want to imagine where I’d be without LAP. “From January through March 2014, I attended the 12-week course at London Art Portfolio. As I want to study architecture, I came to London Art Portfolio to work on both my digital and physical portfolio, which is a necessity when applying to schools. London Art Portfolio, and Julia in particular, gave me creative guidance and help throughout the course to make sure I achieved and produced work, not only I, myself was pleased with, but work that would get me accepted to the schools I applied to. 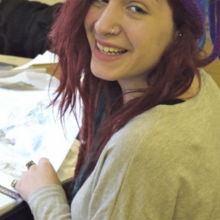 The course helped me prepare for further studies and challenges that come with studying a creative subject. I have studied at London Art Portfolio this year. I have progressed very well. Julia has given me many ideas and has improved my skills. She helps and motivates greatly. There is always a lot to do, but it is good for me to learn, London Art Portfolio is a friendly and good place to improve, and prepare a portfolio also Julia takes us to museums, exhibitions. Julia helped with my English statement and advising with applications. Eu estive estudando em London Art Portfolio esse ano. Tenho progredido bastante. A Julia tem me dado muitas ideias e melhorou minhas habilidades. Ela ajuda a motivar bastante. Há sempre muita coisa para fazer, mas é bom para eu aprender, London Art Portfolio é amigável um excelente lugar para melhorar e preparar um portfolio também Julia levaa museus, exposições. Ela também me ajudou com a minha declaração de inglês e aconselhando com aplicações. “After spending 12 weeks at London Art Portfolio I left feeling very happy with my time spent there leaving with a fabulous portfolio. A bonus from attending London Art Portfolio was having placements at the Art Colleges I wanted to go to! My time at LAP left me with a great deal of knowledge consisting of new skills, new ways of thinking and techniques. I got to experiment with many mediums that I had not used before and one thing I discovered about myself is that I could draw. The course’s structure is very well laid out and in the beginning you may not understand but at the end of it you see how it all fits together and how much you have learnt. It paces you out with the work you do and you go through each stage which helps you lead to your final piece with covering every step possible. Before when I had an idea in my head I would go straight ahead with it but I learnt that with experimentation and pacing yourself makes your final piece so much better and well thought out. Another lovely thing about LAP is the people you meet there which makes it even more worth while. Always a friendly atmosphere with many helping hands at bay. There were many international people which was nice as it gave you an insight to other people’s cultures. I really liked that if you were stuck with your work you always had many open minded and creative people around you who could give you some advice on how to progress with your work. Julia who runs LAP is a very talented and knowledge about the creative world. If you ever had a question she would never fail to answer and always supply you with helpful advice. There were around 20 people when I was attending the course and Julia gave her personal time to every single one of them and not one person was doing the same thing. It made everyone’s work more individual and unique which is very important for interviews as you don’t show up with the same work as everyone else. Julia always had an artist too that related to your work which was always helpful. “Etter å ha tilbrakt 12 uker på London Art Portfolio kurs, var jeg veldig fornøyd med min tid der og endte opp med en fantastisk portefølje. En bonus av å delta på London Art Portfolio var at min portefølje ble bra nok til å komme på intervju på alle kunst skolene jeg søkte på. Jeg har nå sikret meg plass på Hereford College of Art. Etter fullført tid på LAP har jeg tilegnet meg ny kunnskap som består av nye ferdigheter, nye tenkemåter og teknikker. Jeg fikk muligheten til å eksperimentere med mange medier som jeg ikke hadde benyttet før, og en ting jeg oppdaget om meg selv er at jeg kunne tegne. Kursen er svært godt strukturert, selv om du i begynnelsen er du litt forvirret, ser man på slutten av kurset hvordan alt henger sammen og hvor mye du har lært. På kurset lærer man å gå gjennom hvert trinn i ”design syklusen” slik at det ferdige produktet blir mer raffinert og gjennomtenkt. Jeg personlig pleide å ha en idé i hodet mitt og så bare gå rett fram med det, men jeg har lært at med eksperimentering og slikt gjør den siste biten så mye bedre og gjennomtenkt. En annen fin ting med LAP er menneskene du møter. Alltid en vennlig atmosfære med mange hjelpende hender i sjakk. Det var mange internasjonale personer på kurset, dette gir deg et innblikk i andres kulturer. Jeg likte at hvis du ble sittende fast med arbeidet ditt , så var det alltid mange åpne tenkende og kreative mennesker rundt deg som kunne gi deg noen råd om hvordan å gå videre med arbeidet ditt. Julia som driver LAP er en svært talentfull og kunnskapsrik om den kreative verden. Hvis du noen gang hadde et spørsmål om noe, ville hun aldri unnlate å svare og alltid gi deg nyttige råd. Det var rundt 20 mennesker da jeg var på kurset og Julia gav hennes personlige tid til hver eneste en av dem, selv om alle gjorde forskjellige ting. Det gjorde alles arbeid mer individuelle og unike som er svært viktig for opptaks intervjuer. Julia kunne alltid referere til en kunstner som var relatert til arbeidet ditt, som var veldig nyttig. “I have been doing the 6 weeks course at London art Portfolio from mid October to the end of November. It has been a really great and interesting experience for me and it helped me realize which studies I truly wanted to do. London art portfolio is a good and well organized institution, I had the chance to be part of only twenty students and I think this is the best point of the courses they offer. As we are only a few of us taking those courses we are able to ask for help or advice at any moment and have immediate feedbacks from our tutors, generally between three and six per day. Something important that I have noticed and that we barely find in other institution is that we are free to talk to Julia, the headmaster, at any moment, she’s quite always available for each of her student. At London art portfolio you can find quite everything you need to build up your portfolio, no matter which area you’ve choose there is a lot of materials provided for us. 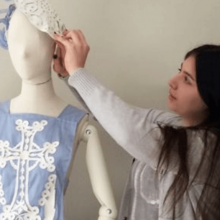 But more than that we had the great chance to have some professional coming over to LAP to teach us their own skills, as a 3D designer and a fashion illustrator. Finally I would say that the most positive part is the presence of our tutors and Julia during all the development of our projects to the end of the building of our portfolio. They have been able to provide to each of us personal advices and helped us find our way through the different courses in the design area. “I am happy to recommend Julia Dennis and London Art Portfolio. Thanks to Julia Dennis’ professional and kind guidance I have been able to enrol in an undergraduate course at Birmingham City University, after comfortably securing two unconditional offers for two separate courses. When I first met Julia Dennis I immediately knew she was a very professional, kind and articulate tutor, something she proved throughout my six week long course. “I saw Julia one-to-one and only intended to do a few lessons to see what it was like. Straight away she made me feel comfortable. Julia is an amazing and very skilled art tutor, her positive energy and incredible wide knowledge makes everything seem so easy. She taught me new techniques and pointed me in new directions. In just a few weeks I regained my self-confidence and developed my art much further than I had dreamed. With Julia’s help I secured a place at Brighton University, Arts department, where I’m currently studying for a BA in Fine Art Painting. I am still in contact with Julia and I’m always looking forward to discussing my ideas with her – she is truly inspirational. “Jeg så Julia til privat undervisning og havde kun planlagt at tage et par lektioner for at se, hvad det var noget for mig. Hun fik mig straks til at føle mig hjemme. Julia er en fantastisk og meget dygtig underviser, hendes positive energi og utrolig brede viden gør at alt synes så let. Hun lærte mig nye teknikker og pegede mig i nye retninger. På bare et par uger genvandt jeg min selvtillid og udviklede min kunst meget længere, end jeg havde drømt om. Med Julias hjælp, fik jeg sikret en plads på Brighton University, Arts afdeling, hvor jeg i øjeblikket studerer for en BA i Fine Art Maleri. Jeg er stadig i kontakt med Julia, og jeg ser altid frem til at diskutere mine ideer med hende – hun er virkelig inspirerende. During the 6 week course at LAP I learned how to develop my ideas from scratch to final presentation. Showing me new techniques and skills LAP helped me to step out of my comfort zone and try things that I would have never thought I am able to create. I felt that Julia was taking care of us not only as a group but as individuals. She gave us support one by one and keeping us inspired through the whole course. I would highly recommend LAP for anyone who is seeking to build a portfolio. A 6 hetes portfolio kurzus alatt megtanultam felepiteni az otleteimet az alapoktol a vegso prezentacioig. A kulonbozo uj technikak segitsegevel, amiket a LAP-nal tanultam, sikerult kilepnem a komfortzonambol es olyan uj dolgokat kiprobalni amire elotte nem is gondoltam, hogy kepes lennek. Julia nem csak a csoportra forditott nagy figyelmet, hanem szemely szerint mindannyiunkra figyelt es tanacsaival vegig segitette a munkankat, hogy inspiraltak maradjunk. Teljesen oszinten es tiszta szivbol ajanlom a LAP iskolat mindenkinek akinek szuksege van segitsegre, hogy egy jo portfoliot epitsen fel. When I first arrived at the London Art Portfolio I was super surprised because I was so warmly welcomed. Meeting people from all over the world was very interesting and exciting for me. I loved the atmosphere of internationality and made friends with the people pretty fast. Working in the studio in the first week was a completely new experience for me because we really had to concentrate to the projects and drawings we were doing but it was fun! To be informed by John, Julia, Petra and Matteo was super helpful. Also Andrea was always there for questions and suggestions (and for distributing popcorn). The second week was full of work because you really had to start thinking about creating your portfolio and also do things you could put in there. It took a lot of your free time but it was definitely worth it. In this week I made the biggest progress. Doing the collages in the third week was very innovative and intense. We got inspired by one of the around 100 art books that Julia has stacked in the study room and talked a lot about artists and intentions of doing art. To exchange thoughts and ideas from all our group members was fascinating because you created an extremely creative brainstorm and shared all the things that were going on in your mind. In the fourth week we realized some of our ideas in real 3D-models with paper. This was a kind of physical work because from all the cutting and folding you began to get real arm muscles. Also your brain got trained because you had to plan how your drawing of the model has to look like in 2D when it should be the real 3D-model when its folded. To take photographs of the models was also interesting because you had to think about the light and the perspective so that you have photographs you can use for your portfolio. In general I can just say that I enjoyed the time at the LAP a lot. I learned so much about art but also about many other things (for example how the microwave worked and how you should use the wifi so that you can use it). I’ll miss this time especially when I’m finishing my portfolio without all my group mates and the useful tips from Julia and Andrea. Als ich das erste mal das London Art Portfolio betrat war ich super überrascht weil ich so herzlich begrü.t wurde. Leute von überall auf der Welt zu treffen war sehr interessant und spannend für mich. Ich habe die Atmosphäre von Internationalität geliebt und habe mich ziemlich schnell mit allen angefreundet. In der ersten Woche im studio zu arbeiten war für mich eine total neue Erfahrung, da wir uns den ganzen Tag auf unsere Zeichnungen konzentrieren mussten, aber es hat Spaß gemacht! Unterrichtet worden zu sein von John, Julia, Petra und Matteo war super hilfreich. Auch Andrea war immer da für Fragen oder Anregungen (oder um Popcorn zu verteilen). Die zweite Woche war voll mit Arbeit weil man sich stark mit dem Thema auseinandersetzen musste und sich überlegen musste, wie man seine Mappe gestalten will. Ebenfalls musste man natürlich Dinge gestalten die man für das Portfolio nutzen konnte. Es hat mich viel meiner Freizeit gekostet aber das war es Wert. In dieser Woche habe ich den größten Fortschritt gemacht. Collagen zu kreieren in der dritten Woche war sehr innovativ und intensiv. Wir wurden inspiriert von einem der ungefähr 100 Kunstbüchern, die Julia im study room gestapelt und im Regal stehen hat, und haben viel über Künstler geredet. Sich über Gedanken und Ideen auszutauschen war faszinierend weil man einen kreativen Brainstorm geschaffen hat in dem man all die Dinge, die im eigenen Kopf rumschwirren, mit den anderen teilen konnte. In der vierten Woche haben wir einige Ideen in 3D-Modelle aus Papier realisiert. Das war teilweise sogar eine körperliche Arbeit, da man vom ganzen schneiden und falten schon richtige Armmuskeln bekommen hat. Auch das Gehirn wurde trainiert da man auf sein 2D-papier 3D zeichnen musste und sozusagen umdenken musste, damit es am Ende auch so aussieht wie man es sich vorgestellt hat. Von den Modellen Fotos zu machen war auch interessant, da man überlegen musste mit welchem Licht und aus welcher Perspektive man fotografieren musste, damit ein Bild dabei rauskommt, was man für seine Mappe verwenden kann. Generell kann ich nur sagen dass ich die Zeit im LAP sehr genossen habe. Ich habe so viel über Kunst gelernt aber auch über andere Dinge (zum Beispiel wie man die Mikrowelle bedient oder wie man das Wifi benutzen sollte damit es funktioniert). Ich werde die Zeit vermissen, vorallem wenn ich mein Portfolio fertig machen werde ohne die Leute vom Kurs und den hilfreichen Tipps von Julia und Andrea.